Okay to use in the rain! Tested to IP54 and 11 categories of MIL STD-810F environmental tests. 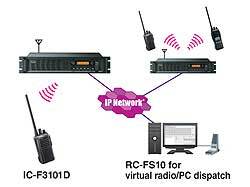 This is a simple and basic setting for those who use the radio mainly for individual and group call. Use the 16-position rotary channel knob to select the appropriate individual or group call. This setting also can be used with analog 2-tone or 5-tone signaling. 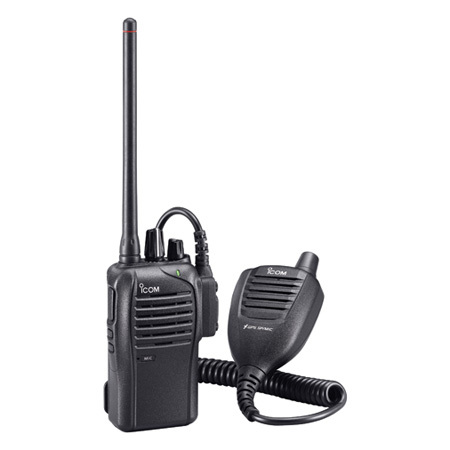 The IC-F3101D series can receive both analog and digital mode signals on a single channel and automatically selects the received mode to reply to the received call, while the talk back timer remains. 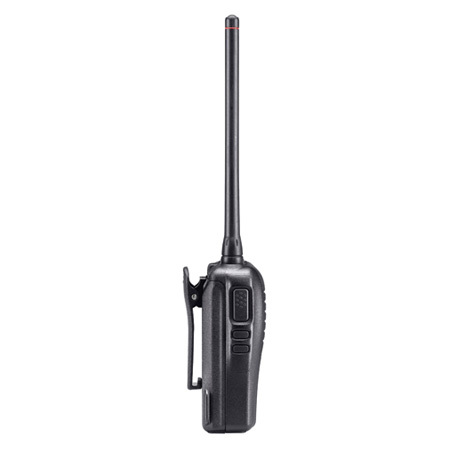 It's a smart way to grow into digital radio – at your won pace, as your budget and comfort allow. 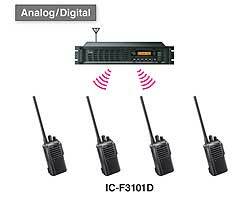 Mix the basic IC-F3101D series with the advanced IC-F3161D series for efficient group managed systems. 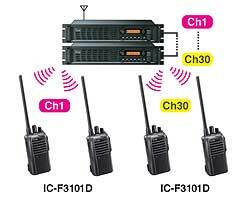 Commands like radio stun, kill and revive as well as the caller ID of the IC-F3101D displayed on the administrator's radio provide efficient communication within the group. 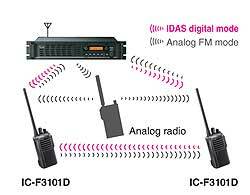 When using the IC-F3101D series in IDAS multi-site conventional mode, the IC-F3101D can communicate with other IDAS radio users working with other repeater sites and/or virtual radio/PC dispatch stations on the IDAS network. 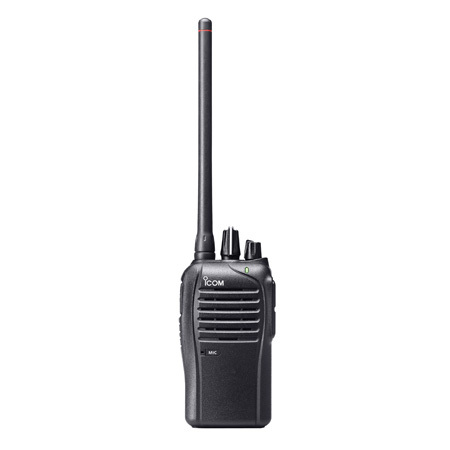 When used with the optional GPS speaker-microphone, HM-171GP, GPS position data can be sent to other advanced IDAS radios (PC and software required) and/or virtual radio/PC dispatch stations. 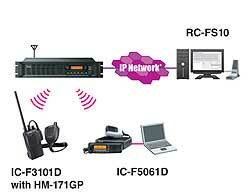 The IC-F3101D series can be used in an IDAS single-site trunking system. The IDAS trunking system is a distributed system (similar to the analog LTR™ trunking) with no control channel, so more voice traffic channels are available for increased system capacity. *All advantages shown represent possible system configurations. 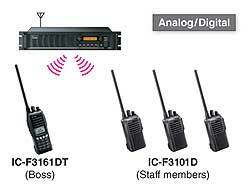 Ask your Icom dealer to configure an IDAS system that works best for you. Note: Private IP Network or VPN Tunnels through the Internet with static endpoints.